The lead investigator of Sheriff Joe Arpaio’s Cold Case Posse returned to Hawaii earlier this week. Returned, that is, after Sheriff Joe sent him there and kept that secret from all but his top deputy. And what does Mike Zullo bring back with him? Evidence. Evidence that officials of the government of Hawaii are frustrating the Obama eligibility investigation on purpose. And evidence to support where the material for the false Obama birth certificate might have come from. WorldNetDaily reported on this secret mission two days ago. Sheriff Joe Arpaio of Maricopa County, AZ, opened his own Obama eligibility file after the Sunshine (Arizona) Tea Party asked him to. Mike Zullo is a retired private investigator from New Jersey; he now lives in Maricopa County. He already made one trip to Hawaii. WND reporter Jerome S. Corsi traveled with him, along with a Maricopa County deputy. The three tried to get Obama eligibility information through channels. Hawaiian officials stalled or rebuffed them at every turn. So Sheriff Joe sent Zullo back to Hawaii alone, to follow up on some interesting leads. Arpaio told no one, other than his chief deputy, that Zullo even went to Hawaii. The leads that Zullo followed involved a girl named Virginia Sunahara. She was born August 4, 1961, at Wahiawa General Hospital in Wahiawa, Oahu, and died one day later. After she was born, she got sick (with what, reports do not say). Doctors transferred her to Kapi’olani Maternity and Gynecological Hospital, or Queens Medical Center, in Honolulu. The Obama long-form birth certificate lists his hospital of birth as Kapi’olani. But at least one birth announcement said he was born at Queens. The problem: the Sunahara family do not have a long-form birth certificate for this little girl. Her brother Duncan tried to get one. The law entitles any family member to get a birth certificate for a dead relative. But Hawaiian officialsrefuse to give him one. Virginia Sunahara is the forgotten lead in the Obama eligibility investigation. Why is she important? Because she was born on the same day that Barack Obama says he was born. If her birth certificate is missing from the record, then maybe some government official made up a birth certificate for Obama and gave it the serial number that Virginia Sunahara’s certificate originally got. The owner of the blog My Very Own Point of View traveled to Hawaii in May of last year. He took pictures of the grave of Virginia Sunahara and various other family grave markers. His fellow investigators suspected even then that Virginia Sunahara’s birth certificate at first had the same serial number as Barack Obama’s short form certificate (called Certification Of Live Birth, or COLB). 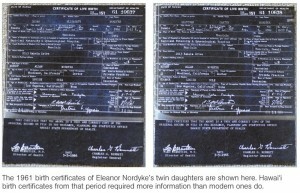 The Nordyke Twins are an earlier Obama eligibility lead. They were born on the afternoon of August 5, one day later than Obama. 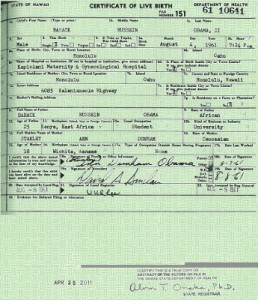 So why do their long-form birth certificates have serial numbers that came before that of Obama? Virginia Sunahara’s papers reached the registrar on August 10, according to the short-form COLB. Her serial number uses four digits for a year. The numbers for Obama and the Nordykes use only two. 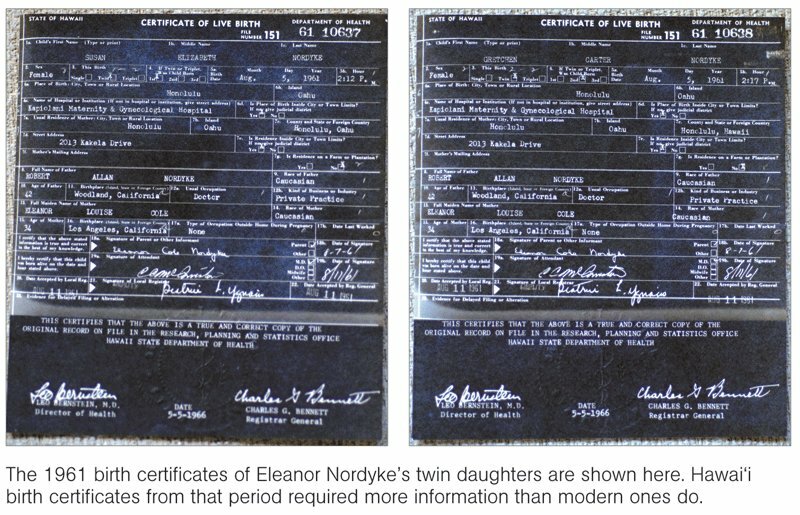 Duncan Sunahara asked for a direct copy of the long-form certificate on his sister, from the microfilm in the registrar’s vault. He wanted to check the serial numbers to see if they matched. The registrar refuses. The Attorney General of Hawaii, Jill Nagamine, furthermore argued in court that Duncan Sunahara did not have a legitimate motive in getting his sister’s birth certificate. All he wanted was to mix into the Obama eligibility flap, she said. She also argued that getting a long-form birth certificate from among fifty-year-old records would be too much work, and might compromise the other records. The problem: Alvin T. Onaka, then as now the Hawaii registrar, wrote separately that he keeps his records easy to retrieve. (And some of his records go back to 1840.) Nevertheless, a local judge accepted the Hawaii AG’s reasoning, however specious that might seem. Added to it, Verna K. Lee, whose signature appears on the Obama birth certificate, says that her office did not make the kinds of mistakes that assigned birth certificate numbers out of sequence. And she certainly wouldn’t have assigned a number 440 places out of sequence. Questions like these keep the Obama eligibility issue alive. But now they raise questions about the integrity of State government. Obama (if that is his real name)is a FRAUD no doubt about it. The fact that the AG of Hawaii argued that Mr. Sunahara's request was somehow related to Obama's eligibility should have no bearing...unless it would prove Hawaii's involvement in the cover-up. IMO, even if Barry was born in Hawaii the real birth certificate obviously would disprove the "Official" nativity story. Somebody lied to you, I'm 70 and I just got a copy of my birth certificate, My mother has been doing family history research and has some from the 19th century.